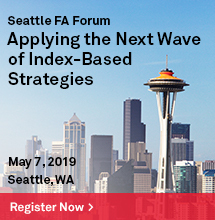 In the past few years a number of indices have been launched with a goal of minimizing the impact of contango. The first indices launched with this goal were the simple (1-5 month) forward indices and the relatively static S&P GSCI Enhanced. In the time period from Aug 2004-May 2011, mentioned in my prior post, these indices did the job of outperforming the front month contracts in the S&P GSCI by reducing the negative impact from contango as shown in the chart below. Source: S&P Dow Jones Indices. Data from Aug 2004 to May 2011. Past performance is not an indication of future results. This chart reflects hypothetical historical performance. Please see the Performance Disclosure at the end of this document for more information regarding the inherent limitations associated with backtested performance. However, 2012 told a different story, where the S&P GSCI 3-Month Forward and S&P GSCI Enhanced underperformed the S&P GSCI by 1.6% and 0.3%, respectively, but the S&P GSCI still was not the star performer. The S&P GSCI Dynamic Roll outperformed the S&P GSCI by 2.3% for the year. Source: S&P Dow Jones Indices. Data from Aug 2004 to July 11, 2013. Past performance is not an indication of future results. This chart reflects hypothetical historical performance. Please see the Performance Disclosure at the end of this document for more information regarding the inherent limitations associated with backtested performance. 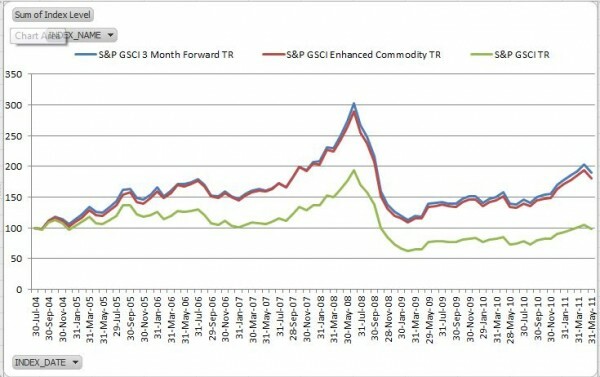 Immediately noticeable over the entire time frame from Aug 2004 -Jul 2013, is the gain earned by moving from the S&P GSCI, which has a world production weighting of 24 commodities, to the S&P GSCI Equal Weight Select, which includes a sampling of the most liquid commodities from each sector of the S&P GSCI to reduce the number of constituent to 14 commodities that are equally weighted. 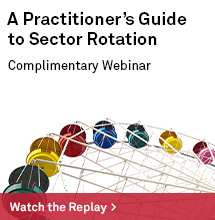 In 2012, the S&P GSCI Equal Weight Select gained 3.1% versus the S&P GSCI which was up 0.1%. 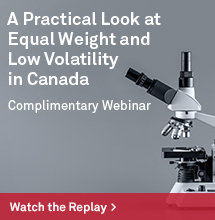 The next improvement is earned by changing the weights from the S&P GSCI Equal Weight Select based on the change in realized roll yield as illustrated in the newly launched S&P GSCI Roll Weight Select, which gained 4.0% in 2012. 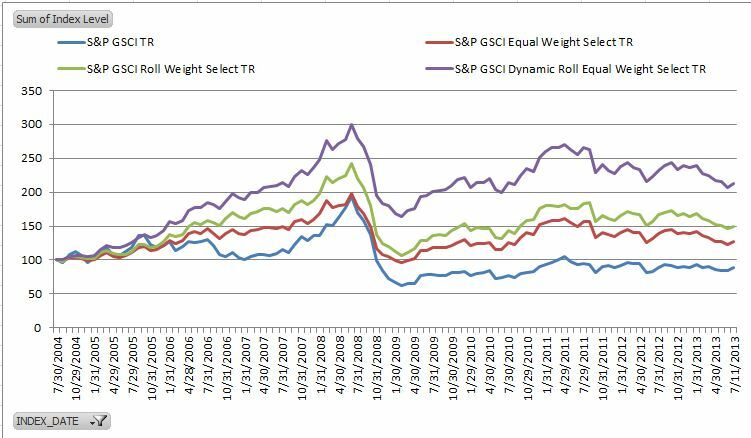 Finally in the chosen period, the S&P GSCI Dynamic Roll Equal Weight Select, which only changes the contract based on implied roll yield when compared to the S&P GSCI Equal Weight Select, added the most value overall. 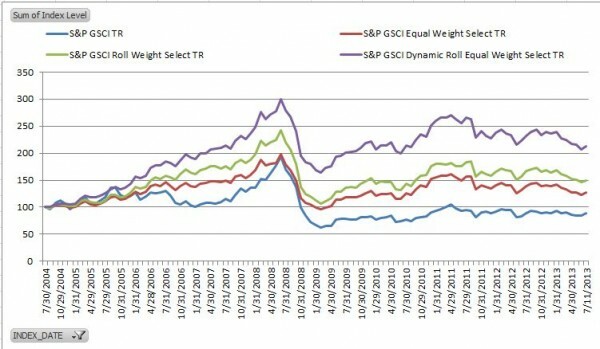 However, the S&P GSCI Dynamic Roll Equal Weight Select only gained 3.6% in 2012. 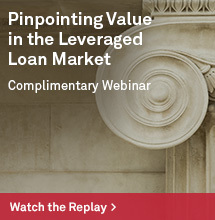 It is possible there is more of a premium to be gained by giving up some liquidity as the contracts are longer-dated but it may depend on the time-frame. Overall, whether the better choice is to roll or to weight may just depend on how long the wait is to roll or to weight.